When you’re making big moves with your business, whether it be excavation equipment, industrial equipment, or any other form of large load, hiring a quality heavy-haul trucking company is imperative. This ensures that your expensive assets make it from point A to point B with less hassle and worry. The team at Trophy Transportation is capable of providing heavy equipment hauling services across the country, so no matter where your business is operating, you can trust our expertise and heavy-duty trucks to keep transportation from slowing your projects down. We understand that in order to save some expenses, many companies will attempt to find their own methods of transporting heavy equipment for their jobs. This can not only cause more headaches for you in operating your business, but it can also end up costing you more than you bargained for if you don’t trust a professional transportation company with your heavy equipment haul. The following are a few factors to consider when contemplating whether or not you should hire a heavy equipment hauling service for transporting your company’s much-needed machines from jobsite to jobsite. The transportation of any large, heavy equipment presents unique challenges, where trying to use the company truck and trailer simply won’t get the job done. The proper handling of these oversized machines is essential to preserving the state of your equipment as well as the safety of everyone else out on the roads. On top of this, heavy haul freight requires certain transportation equipment and vehicles in order to meet legal requirements such as axle restrictions. With the world’s most dependable trucks and trailers behind our drivers, Trophy Transportation is able to handle any heavy equipment hauling, no matter what size it may be, and safely get your load to where you need it, when you need it. The length of your heavy equipment haul can also lead to many logistical challenges for you and your company if attempting to do so using your own means. In order to ensure that everything goes smoothly during your cross-country heavy equipment transportation, you should lean on a company that has been there and done that — time and time again. Trophy Transportation provides heavy equipment hauling throughout the contiguous 48 states, and our team of drivers know the highways like the back of their hands, so they can always take safest and most efficient routes for transporting your heavy load to your jobsite. One of the biggest concerns contractors face is the on-time delivery of their cranes and other heavy construction equipment in time to start their projects. When you trust a reputable heavy equipment hauling company with this task, it takes the weight off your shoulders and gives you more peace of mind knowing you have a team with a proven track record for prompt delivery bringing your equipment to you. Another aspect of heavy equipment hauls is obtaining the proper documentation and permits prior to transporting. Most states require freight to have a permit for the machinery traveling on their highways, and depending on the time of year, there can be limited travel hours or additional permits required depending on which states your heavy equipment will be passing through. This is another stack of paperwork that you as a business owner do not want to deal with if you don’t have to, and with Trophy Transportation, you don’t! Since our transportation team does this around the clock, we know every permit required to transport your heavy equipment no matter where in the country it needs to go, and we always ensure to follow proper permit and safety procedures on each trip we take. No matter what size your business may be, you likely don’t enjoy seeing money go out the window on unnecessary costs. While transportation is an unavoidable cost with any industry utilizing heavy equipment, there are certainly a multitude of ways to ensure you aren’t spending any more than you have to. At Trophy Transportation, we use proven load and transport techniques that not only ensure the safest and most efficient superload deliveries, but they also cut out the unnecessary costs that you might run into at another company or when attempting to transport heavy equipment by your own means. We also provide custom quotes as we always strive to work within your budget and determine a logistical plan that makes the most sense for your needs. 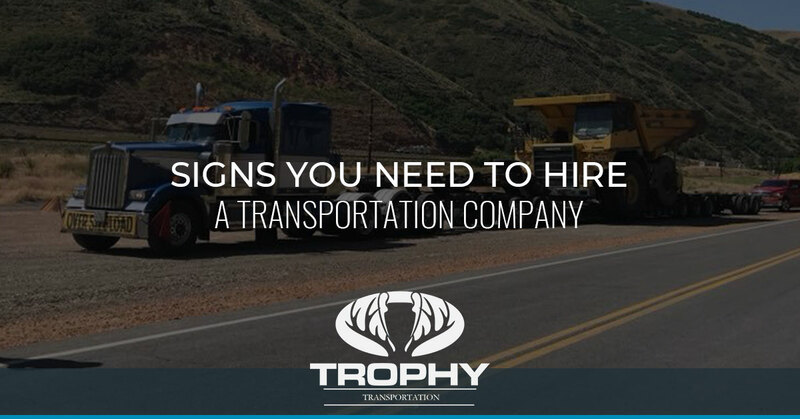 Now that you see some of the primary factors that you should consider when deciding whether or not to hire a third party hauling and logistics service, we hope that you will reach out to us at Trophy Transportation if you decide it’s what is best for your company! From sliding rear-axle trailers to double-drop lowboys and everything in between, we’ve got the transportation equipment to accommodate any heavy equipment haul you may need.